Venice is well known for its canal system with beautiful buildings hugging the banks and romantic gondola rides. It is also famed for the Piazza san Marco and the Cathedral, the Gothic Doge’s Palace and the Rialto Bridge. The city is also known for its delicious cuisine, served in some of the best restaurants in Venice, either overlooking the canals, or tucked away in quaint corners of the city. There is also, of course, the colorful, annual Carnival in Venice with its beautiful costumes and masks. However, there is also a fascinating, less-seen side to this Italian city, places the average visitor mind never discover. Explore some of those locations below. Due to climate change and the occasional rising tides, many of the buildings lining the Venice canals suffer from flooding. 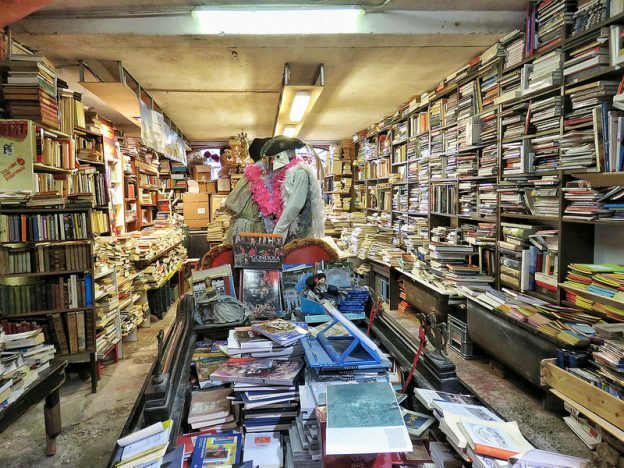 One book store was so fed up with constantly finding their books under water, they made a number of changes. Not only are the bookshelves propped higher up from the floor, but many of the best books are to be found in boats and even bathtubs in the store. In fact, in one of the many cramped rooms a full-size gondola is being used to store books. For added atmosphere, many stray cats have made the book store their home and when there are rising tides, they can be seen relaxing on top of the stacks of books. Another whimsical touch is the store’s “fire escape,” which is merely a door which opens onto the canal. In case of fire, hold your nose and jump! The “Island of the Mad” asylum was opened for insane men in 1725 and women were accepted from 1798. The asylum was run by a religious order, San Giovanni di Dio and saw around 200,000 patients arriving there over its lifetime, many of whom would never be allowed to leave. When laws relating to asylums changed in 1978, it was closed and was later reopened as a museum dedicated to the asylum’s history. These days, visitors can see the original equipment used in the asylum in various sections, including the Ambulatory, Laboratory, Didactic Products, Straightjackets, Sickness Therapies, Lodgings, the Anatomical Theater and the Pharmacy. There is also a photo gallery of patients who were held in the asylum from 1874 until it closed. On a prettier side, there is an extensive garden on the property which includes trees and rare plants used in the pharmacy. If visiting Venice during high season, sometimes it can be crowded and visitors might feel like a little peace and quiet. There is a small island in Venice’s North Lagoon called Torcello, which is accessible by water bus (vaporetto) and is ideal for a little quiet time. The island has a rich history, as it is where the city originally began over 1,500 years ago. There used to be a large population on the island, but these days there are only a few local residents. On a visit to Torcello, the Basilica di Santa Maria Assunta is worth a visit. Built in 639 AD, the building is in an excellent state and there is a Campanile, or bell tower, on the site as well as a second church. Climbing up the bell tower offers a wonderful view over the island and beyond. Enjoy your unusual visit to Venice this year, visiting out of the way and interesting locations.